We welcome you to visit TPC anytime for services, to meet with our church staff, or to attend events and classes. Please use the module below to get directions to TPC. Parking is available in the Thompson Hall lot located on the Central Avenue side of the building (enter on Chesapeake Avenue, exit onto Central Avenue) and on Highland Avenue. 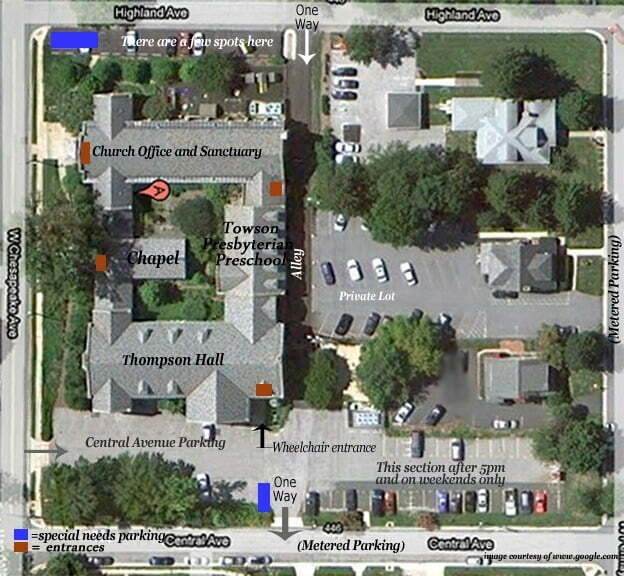 Wheelchair accessibility to the Sanctuary is available using the Thompson Hall entrance. A small chair lift is available at the main Narthex stairs on Chesapeake Avenue for those who are able to navigate the exterior steps at the front entrance. Please enter your address in the boxes below for custom directions. Select areas and rooms are available for rental such as the Sanctuary and Chapel for weddings and the occasional appropriate music events, Thompson Hall for plays and dinners, the activity room/ gym and some rooms for meetings. Please contact Kathryn Bojanowski for details and rental policies. All events are subject to prior church approval. Floor plans and a leasing document that contains the application, rules/regulations and leasing rates are available by following the links below. Rates and policies are subject to change. TPC will seek to have the sanctuary open for worship, every Sunday, regardless of weather conditions. In case of inclement weather, however, the 8:30 a.m. service and church school/ adult education classes may be cancelled. A decision will be made and communicated by 8:00 a.m. on Sunday morning. The church plans to hold the 10:00 a.m. Sunday worship service, with rare exceptions. TPC's leaders are not able to promise in all conditions that the church grounds will be clear and safe; if conditions for walking or driving to church seem dangerous, parishioners are urged not to come to church. Meetings and programs other than worship services may be cancelled at any time (on Sundays or during the week) if weather conditions become unfavorable. Also, the church office may close when weather conditions present a danger for travel. Sign up for text messages and/or email notification through the RainedOut system.